5 What should you look for in a Yoga Strap or Sling? I have struggled over the past 15 years of my life with trying to maintain a healthy and active lifestyle. A while ago I started yoga as a core-building and relaxing activity since some of my friends recommended to give it a try. I have been pleasantly surprised with the results of doing yoga and the relaxing effect on my mind as well. 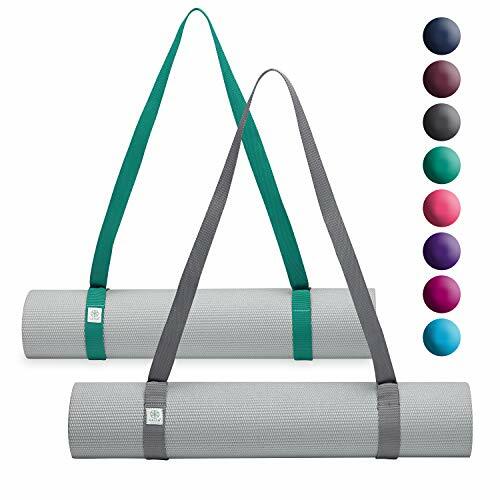 After I was convinced I wanted to keep exploring yoga, I began to research yoga accessories (somehow I love to use the best equipment avilable when I start something new. It keeps me motivated and it's more fun in general) a carrier strap for my yoga mat to bring to class with me. 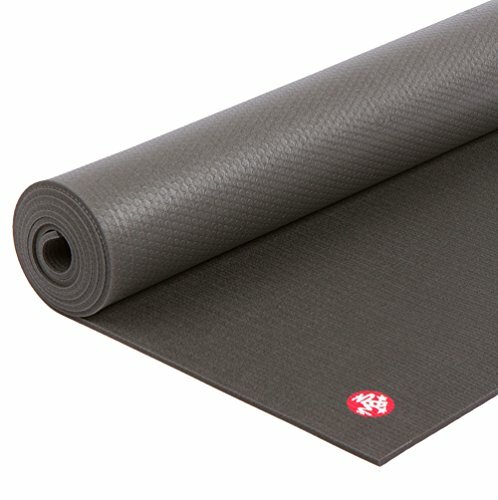 After a lot of initial research, I came up with a few options for the best yoga mat strap. Now, you may be wondering why you actually need a strap, and why you can't just carry it to and from class. As I quickly discovered, a yoga mat is bulky and awkward to carry rolled up under your arm. Having a strap is also a lot sleeker than stuffing it into a bag. It also makes it easy to carry no matter what distance you have to travel to get to your yoga class. A yoga strap or sling can be used similarly to resistance bands. They can help stretch out your muscles further than you could do it naturally. When used correctly, the strap can also help you keep your spine straight while you hold different positions. It will help you open up your shoulders and various other limbs during your stretches. A yoga strap can also be used at work or at home to help your posture. It goes beyond the context of just a yoga class or yoga poses. When the straps are positioned properly, the strap will help pull your shoulders back and elongate your spine to help you maintain excellent posture. What should you look for in a Yoga Strap or Sling? Yoga straps and slings come in different materials. If you are going to be using it in one of the ways described in the previous paragraph you will be looking for slightly different characteristics than a strap just designed to carry your yoga mat. If you are going to use it to exercise with, you will want to look for a material that will be comfortable and not feel like it is cutting your skin! The most common materials are cotton or nylon. You can find a strap in almost any color you can think of, and even multi-color straps. The color does not affect functionality or signify anything, it's just for aesthetic appeal. Just as a small piece of advice, you may want to stay away from white or very light colors that will show sweat marks. There are quick release buckles, D-rings, loops on a strap, straps you cinch together or ones with no buckle at all. Quick release buckles would be good if you like to pack up your mat quickly at the end of class. You can roll up your mat and just buckle it together to be on your way. D-rings are convenient if you want to use the strap as an exercise accessory. The strap can be adjusted to any size necessary for your shoulders, hips or legs. The downside of a d-ring is needing to feed the strap through it to put your mat away. It takes a little more time, but the extra time is worth it if you are going to use the strap for stretching. You can buy a sling that has loops on the end of the strap. You will have to roll the mat up and fit it through the loop. The loops also serve as handles when using them for stretching. A cinch buckle is one that you can crank tighter, instead of just pulling it. There is a small section of people who believe the D-ring slips easily, and a cinch strap keeps the strap at the tightness you desire. If you are only going to use your yoga strap for carrying your yoga mat, you will not have to worry so much about the length of your strap. Overall this sling is a good choice if you are going for design over functionality, unless you are just looking for a carrier. If you are looking for a carrier and not a strap to use during yoga this is an excellent choice. If you do not have a thick mat, there is a possibility the mat will not stay put. The velcro only fastens to a certain part of the strap, and a thin mat will require the velcro to go beyond the closure. Assorted colors to bring some style. Can hold a mat up to 5.5 inches in diameter, and will fit thicker mats. Velcro closure- will not stay closed if you are using it for resistance or any strong pulling. Closure could also snag on clothing. Not good for a taller individual. You do not get to pick the color you receive. Not ideal for thin mats. The cinch buckle on this particular strap is both a positive and a negative because it is very easy to roll up any size mat inside the strap. However, it has a tendency to unroll when you put the mat on the ground. The cinch buckles won't keep it tightened, but they will hold a full size mat and towel. The thickness of the ensemble inside the strap is easily accommodated. The cinch buckle is just as quick as a velcro closure, and won't slow you down if you are in a hurry. It is an attractive looking strap that is comfortable to carry. Perfect for long or thick mats. Easy and quick to secure mat in. Less than 6 feet long. Mat frequently unrolls inside the straps. Not long enough for tall people. 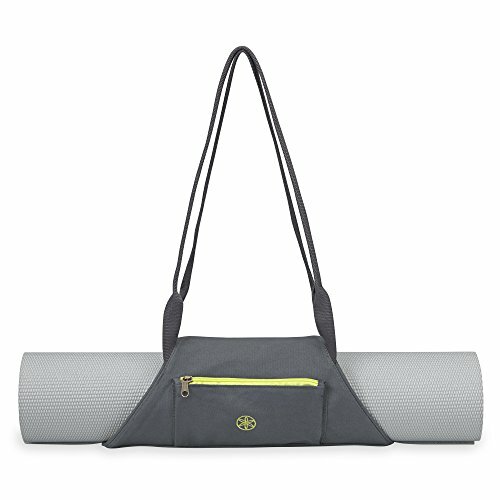 This sling is a great choice for every type of yoga activity and then some. One of the downsides is that it is not very gender neutral, and may snap if pulled too far. It is not as durable as some of the other straps available. The biggest benefit to this sling is the ability to be used as more than just a strap. It could also be used for non-yoga related exercises. Resistance bands are helpful for posture, strength exercises and building your core. The loops for the mat can be used as handles. If you slip them over the mound of your toes, you can gently pull back to strengthen your back. You can strengthen the resistance by walking your hands down the sling. Stretchy so it can be used as a resistance band. Fits most standard-thick size mats. Can be a little too stretchy. Purple color may not be gender friendly. Can leave creases in your mat if it is especially thick. If you are not looking to use the yoga strap to increase your flexibility or improve your posture, this is an excellent carrier. It will fit just about any mat, because the interior strap is stretchy. Because the carrier is more open than the other straps or slings, this is a great choice for the larger, thicker mats and can accommodate a towel as well. This is a very stylish carrier. The zippered pocket is very convenient for my car keys and wallet. However, the limited uses are a big downfall for this choice. Less bulky than a bag. Could be worn as a backpack. Interior strap to keep the mat rolled inside the carrier. Zipper pocket outside to store keys or other possessions. Fits thick mats and standard size mats. Cannot be used as a yoga strap. 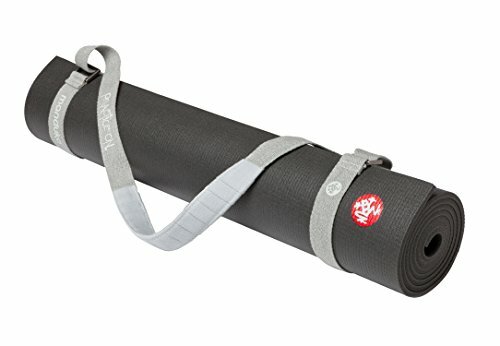 If you are looking for the best yoga mat carrying strap, the strap from Manduka Strap beats the others in functionality and versatility . 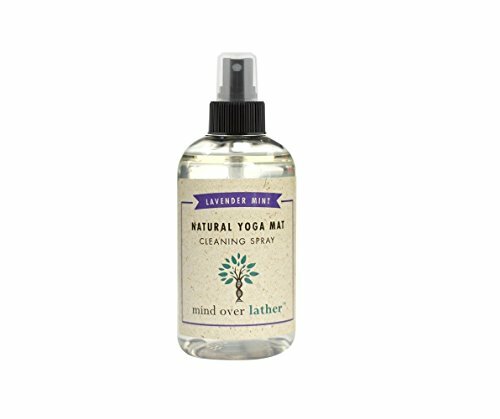 It is easy to use and can be used at work or in the yoga studio. Because of it's neutral color, you can wear it without drawing a lot of attention to yourself. It is durable and is worth the extra money. It will last longer than the resistance band type of yoga straps. It is longer than the other straps, and has more than the carrying case can offer. You don't have to bother with a cinch and worry about it falling out when you place it on the ground.